Now that the iPad has been released, there are three kinds of apps in the App Store: apps made specifically for the iPhone, apps made specifically for the iPad, and “hybrid” apps that include both iPhone- and iPad-optimized interfaces. The problem is that while the iTunes Store provides a convenient button for browsing either just iPhone or just iPad apps, the rest of iTunes appears to be ignorant of this distinction. The Apps view, listing all downloaded apps, doesn’t differentiate by default, and when your iPad is connected, the Apps tab for your iPad provides no way to view just the iPad apps. 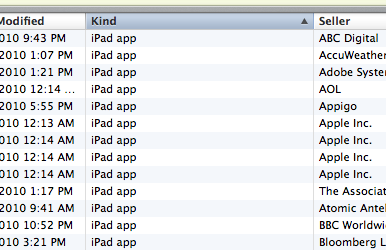 There are a couple ways to ferret out your iPad and hybrid apps, however. Click on the Apps item in iTunes’s sidebar—your iPad doesn’t need to be connected—to view all downloaded apps. Then choose View -> As List to view those apps in a sortable text list. Next choose View -> View Options and check the box next to Kind (or right-click any column header in the Apps view and choose Kind to enable it); this action adds the Kind column to the list. Click this new Kind column and your apps are now sorted by app type: iPad app, iPhone/iPod touch app, or iPhone/iPod touch/iPad app (click again to invert the sort order). Unfortunately, iPhone/iPod touch apps end up between the two types of iPad-optimized apps, so it’s a bit of a hassle to view all apps with an iPad interface. But it’s better than nothing, right? Of course, these options don’t help you while you're deciding exactly which apps to sync to your iPad (in other words, when you select your iPad in the sidebar and view the Apps tab). But it at least makes it easier to see how many of your apps will take advantage of the iPad's larger screen and other unique features. Here’s hoping Apple fixes this omission, and makes it easier to automatically sync just iPad-optimized apps to your iPad, in an update to iTunes.